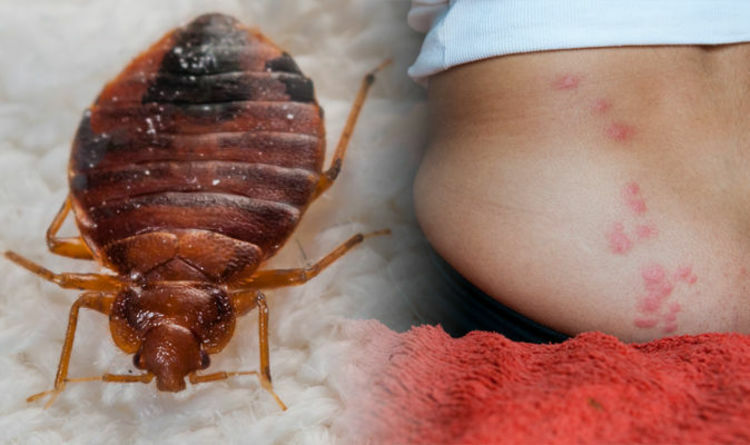 Bed bug bites occur at night which can make spotting an infestation extremely difficult. The small insects live int he cracks and crevices in and around mattresses and beds and feast on exposed skin for blood. Spotting them is also hard because adult bedbugs only grow up to 5mm long, which is a similar size to an apple seed. One way to tell if its bed bugs that have bitten you is to look closely at the bites. There are three distinguishable signs to look out for, according to Rentokil. The first, is bed bugs tend to bite on the neck, hands, arms and legs. Secondly, if the bites are found on different parts of the body this mans multiple insects have been feeding. Finally, red marks are usually found in a line. So how can you get rid of an infestation? The pest control company has four DIY options to help reduce the numbers of bed bugs in your home. Step one: Inspect your bed – check mattress seams, bed frames, headboards, along the edge of carpets and furniture nearby to spot live insects. Step two: Wash your bedding – do this on a high temperature of at least 60C and ideally for around 90 minutes. Step three: Add heat – after washing place bedding in a tumble dryer for a minimum 30 minute cycle. Step four: Vacuum – vacuum your bed, mattress and anywhere else you’ve spotted bed bugs. Rentokil adds: “Use these attachments to clean along walls and around edges. Afterwards, take the vacuum outside of your property to empty into an outside bin and seal securely. These steps are unlikely to eradicate an established infestation. The most effective solution is to call in a pest control expert. The NHS advises bed bug bites fade in a few days. If they’re very itchy, you can buy a mild steroid cream (such as hydrocortisone) or antihistamine tablets to relieve the itch. You can try and spot the presence of bed bugs in your bed. You may be able to spot the small bugs or tiny white eggs. A bright torch can help with this. Tiny black spots on your mattress may also be apparent – this could be their dried poo – or you may spot blood spots on your sheets if a bug has been squashed after it’s fed. An unpleasant, musty smell in your bedroom can also indicate an infestation. If you’re looking to prevent bed bug infestations, avoid buying second-hand mattresses and carefully inspect second-hand furniture before bring it in your home. Additionally keep your bedroom tidy and remove clutter. Horsefly bites have also been common this year. The bites are painful and itchy, but there are five other signs you may have been bitten.